Beebe Healthcare is ready for its 100th Anniversary in 2016. The healthcare organization showed its community spirit during the Lewes and Rehoboth Beach parades earlier this month. Leanne Prosser, Beebe’s Coordinator for the 100th Anniversary, said more than 150 people came out to walk with Beebe for the two parades, which featured a replica of a 1921 Beebe Hospital ambulance towing a 100th birthday cake float surrounded by Beebe babies, Beebe team members, volunteers, family and friends. Anna Beebe Moore, the oldest living relative of the Beebe brothers who founded the hospital in 1916, was the Grand Marshal for the Lewes Christmas Parade along with Jeffrey M. Fried, Beebe Healthcare President & CEO. 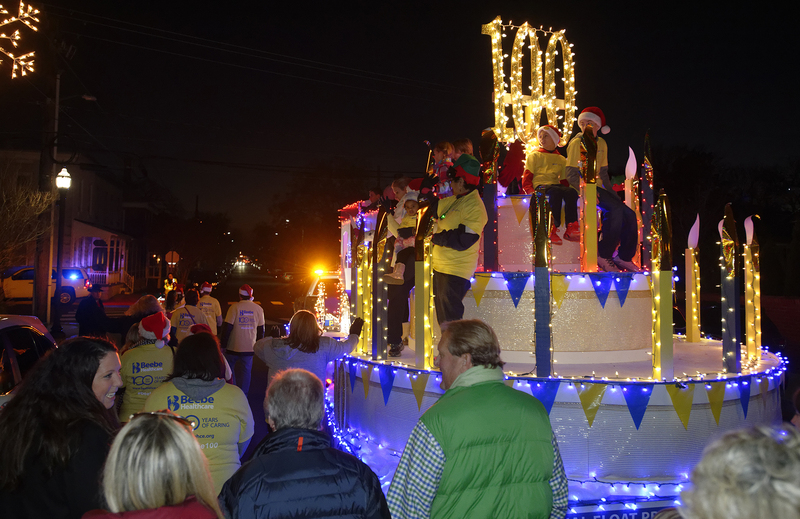 The Beebe 100th Anniversary float won First Place in the Community category during the Lewes Christmas Parade and won third place in the Commercial category during the Rehoboth Beach parade. Beebe wants to thank all the businesses who helped build the float: Broadpoint Construction, Sundew Painters, Oak Construction, Echelon Custom Homes, Sound FX, Yoder & Sons Truss Company, Wyoming Millwork, AdArt Signs, IGI Construction, Kenny Hopkins, and CLC Landscaping. Beebe is especially grateful for Anna Beebe Moore and the Beebe family who participated in the parades. Both parades were such a success thanks to the 100th Anniversary Event Co-Chairs: Kathleen Schell, Benedette Cooper, and Eileen Clark. For more information on upcoming events related to Beebe’s 100th Anniversary in 2016, go to https://beebehce.org. 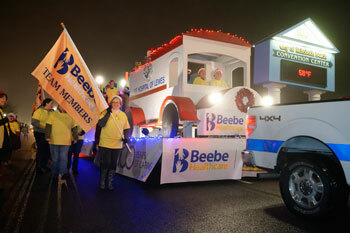 Beebe Healthcare team members, family, and friends, got a ride through downtown Lewes on a giant 100th birthday cake during the annual Lewes Christmas Parade. Beebe Healthcare team members and volunteers carried flags recognizing all those that contribute to the success of the healthcare system. In 2016, Beebe will celebrate its 100th anniversary.